The bad, and the obvious: traveling, inherently, is not the most eco-friendly activity you can partake in. The good: As a tourist or traveler, we can do something about it. Being a tourist often means jacking up your carbon footprint with various modes of transportation, eating food that’s been carted in to the areas that you’re visiting, shopping in markets and purchasing items produced with various ethics and maybe some not-so-sustainable business models. It’s a lot to think about, and I’ll be one of the first to admit that this guilt is not something I want constantly hovering over my head while I’m having a good conversation with someone I’ve just met at a coffee shop in a new city or while I’m looking for a meaningful gift to take home to Mom. It does kind of detract from the whole experience. But as a traveler, we have an immense responsibility. Jetting or road-tripping (or cycling, walking, running, horseback riding, etc.) to see the world is a beautiful gift, and we really shouldn’t take it lightly. Just as we try to “greenify” our lives back home, we can try to spruce up our travel game to be a bit more self-sufficient and leave less of a consumerist trail in our wake. So, below, I’ve listed some top tips for being an eco-friendly traveler and some solid examples of how I make it happen, even when it’s inconvenient. The coolest part is I found the inspiration from a poster in Sanur, Bali while disembarking a ferry. It was plastered to a telephone pole. Zero Plastic Lembongan, which I hadn’t heard of before the poster, is an amazing company working to build awareness about the waste we create. They created this initiative to encourage change. At the bottom of the poster they claim “No rights reserved. You can copy, reproduce, and distribute it as much as you want.” Having seen that, I realized it was time for me to do my part and share it with you. You may have heard all of these tips before (they’re focused on single-use plastics), but maybe not. Let it be eye-opening where it can be! Hopefully, in turn, you can share this post with someone you think might find it useful. 1) Say “HELL NO” (or just no) to single-use plastic items. There is a huge plastic waste problem junking up our world and our sea. I’m not going to go into it here, as you may have read about it in many of my other posts. But in terms of how it relates to travel, you notice the plastic problem a lot more when you become less self-sufficient. There’s no well-stocked kitchen waiting with all of your cookware and to-go containers and coffee cups and bulk foods. You have to plan for this lifestyle shift! For example, when I’m at a market and I want to eat something that looks divine but is only available as take-away, I look for a way to get it without the take-away container (if it’s cardboard, I’ll usually go with it, but I try to have my own option). If it’s simply not possible or becoming too difficult, I’ll politely “refuse” to buy it. Refusing doesn’t mean being annoying or rude about it. You can just give the stall owner a polite “no” while knowing why you’re making the decision you’re making. Maybe even mentioning why you’re making the decision to spark that train-of-thought in the stall owner. If she or he knows that eco-friendly options are a priority for their customers, they might shift their mindset. I did a write-up on that here. An example of what I do? I tote around my Patagonia Provisions Bamboo Utensil Set to avoid using the single-use bits. I’ve used it several times on my trip to Indonesia already. Buy yourself a stainless steel or bamboo straw and throw it in there too - it’s perfect for fresh coconuts off the side of the road! Instead of traveling around Southeast Asia or Africa and buying plastic water bottles as you need them, grab yourself a filtering water bottle or fill up at water-refill stations. Some places, like Bali, have stations scattered around that you can fill up your water for free, which you can locate at www.refillmybottle.com. If you don’t like relying on finding these stations or you know you won’t be around them, invest in a filtering water bottle. My favorite? Grayl. Hands-down. Both my friend Sarah and I purchased these for our trip to Indonesia (and she’s taken hers on to Cambodia and Thailand) and it has made it so simple to fill up from the tap of any homestay or hotel. We’ve also found that most places in Bali have filtered water available, as the island caters to more and more tourists. So you can filter when you need, or just refill it with clean water. I’ll be putting up a review of the bottle soon! This one is along the same vein as those above. Just don’t. They end up in our seas. They’re unnecessary 99% of the time. Bring your own stainless steel straw and rock it! I’ve been so happy to find most of the bars/restaurants on Bali have switched to some beautiful bamboo straws (even glass straws in some spots), so have a a look around when you arrive at a place and see if you’ll even have to make a request for “no straw.” You might not have to! This means saying no to plastic-wrapped or takeaway food and single-use plastic cutlery. Basically, putting a little more thought process into where you’re eating can go a long way. If you walk up to a cafe and you see plastic forks and straws everywhere, maybe give it a miss. It’s so hard when you see a cute local family who just wants you to eat in their restaurant! Their food is probably delicious. But just make polite conversation for a bit and then move on. Remember to be respectful of their culture and lifestyle, don’t diss their way of life. 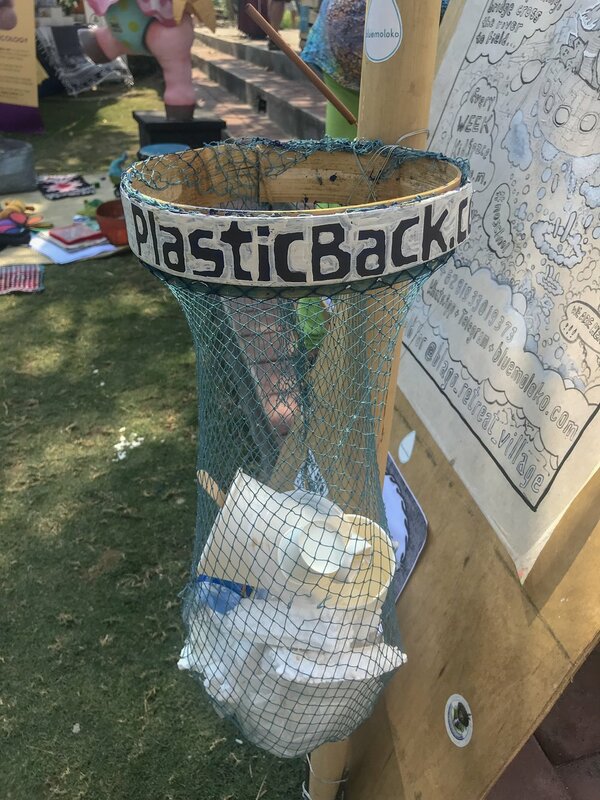 Plastic has made life a lot easier and more sanitary for them, and you most likely don’t have something to offer them yet that can help them make the shift. This is where we really need help. So choose restaurants that source locally, eat as the locals do (but not out of takeaway containers) and be a conscious consumer. Yep. BYO cotton reusable bags to make your life way easier. Take it to the markets, to the beach, to get your laundry - really wherever. It’s very multipurpose, especially if you choose a cute one! So go with it. Plastic bags are everywhere in Southeast Asia. Don’t contribute to the problem. So there you have it! Some straightforward suggestions to get you thinking about responsible travel. Do it for the environment. If you’re going out in the world to see and experience things, remember to leave only good vibes behind…not a trailing path of plastic bags and shampoo bottles. Looking for eco-friendly beauty products to travel with? Check out my collaboration with New Zealand-based beauty brand Ethique. They have some amazing plastic-free beauty bars (shampoo, lotion, conditioner, soap, etc.). We’ll see you out there, nomad!